DNV Hospital Accreditation Visit: KUDOS! Nicklaus Children’s Hospital, part of Miami Children’s Health System, announces the successful completion of its new accreditation process from DNV GL - Healthcare. 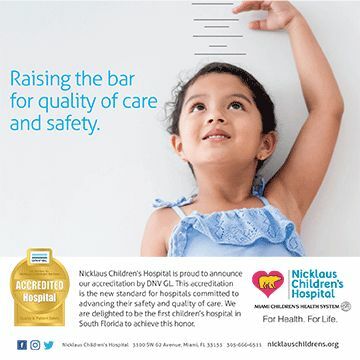 By earning accreditation, Nicklaus Children’s has demonstrated it meets or exceeds patient safety standards (Conditions of Participation) set forth by the U.S. Centers for Medicare and Medicaid Services. DNV GL’s accreditation program is the only one to integrate the ISO 9001 Quality Management System with the Medicare Conditions of Participation. Nicklaus Children’s has three years from the date of its accreditation to achieve compliance/certification with ISO 9001, the world’s most trusted quality management system used by performance-driven organizations around the world to advance their quality and sustainability objectives. View the Nicklaus Children's Hospital article here.